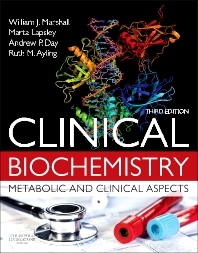 Now fully revised and updated, Clinical Biochemistry, third edition is essential reading for specialty trainees, particularly those preparing for postgraduate examinations. It is also an invaluable current reference for all established practitioners, including both medical and scientist clinical biochemists. Building on the success of previous editions, this leading textbook primarily focuses on clinical aspects of the subject, giving detailed coverage of all conditions where clinical biochemistry is used in diagnosis and management – including nutritional disorders, diabetes, inherited metabolic disease, metabolic bone disease, renal calculi and dyslipidaemias. The acquisition and interpretation of clinical biochemical data are also discussed in detail. The uses of biochemical data in clinical medicine. The acquisition of biochemical data. The interpretation of biochemical data. Sodium, water and potassium. Hydrogen ion homoeostasis, tissue oxygenation and their disorders. Calcium, phosphate and magnesium. The kidneys, renal function and renal failure. Proteinuria. Renal tubular disorders and renal stone disease. The clinical biochemistry of nutrition. Nutritional disorders and their management. The clinical biochemistry of the gastrointestinal tract. The assessment of hepatic function and investigation of jaundice. Acute and chronic liver disease. Diabetes mellitus: pathophysiology and biochemical background. The clinical management of diabetes mellitus. Hypoglycaemia. Hypothalamic, pituitary and adrenal disorders. Thyroid dysfunction. Hormonal aspects of non-endocrine disease. Abnormal sexual development. The clinical biochemistry of female reproductive function, including pregnancy, oral contraception and hormone replacement therapy. Reproductive function in the male. Inherited metabolic disease. Paediatric clinical biochemistry. Biochemical aspects of anaemia. The porthyrias and disorders of haem synthesis. The haemoglobulinopathies. Immunology for clinical biochemists. Metabolic bone disease. Biochemical aspects of articular disease. Muscle disease. Investigation of cerebrospinal fluid. Biochemical aspects of psychiatric disorders. Biochemical aspects of neurological disease. Biochemical aspects of mental retardation. Lipid metabolism, hyper- and hypo-lipidaemias. The clinical biochemistry of the cardiovascular system. Therapeutic drug monitoring. Poisoning. Metabolic effects of tumours. Tumour markers. Molecular clinical biochemistry. Free radicals. Emeritus Reader in Clinical Biochemistry, Kings College London, London, UK; formerly Consultant Clinical Biochemist and Clinical Director of Pathology, The London Clinic, London, UK.